Thank you to Pampers at Sam's Club for sponsoring this conversation on diaper changing station essentials. The opinions and text are all my own. 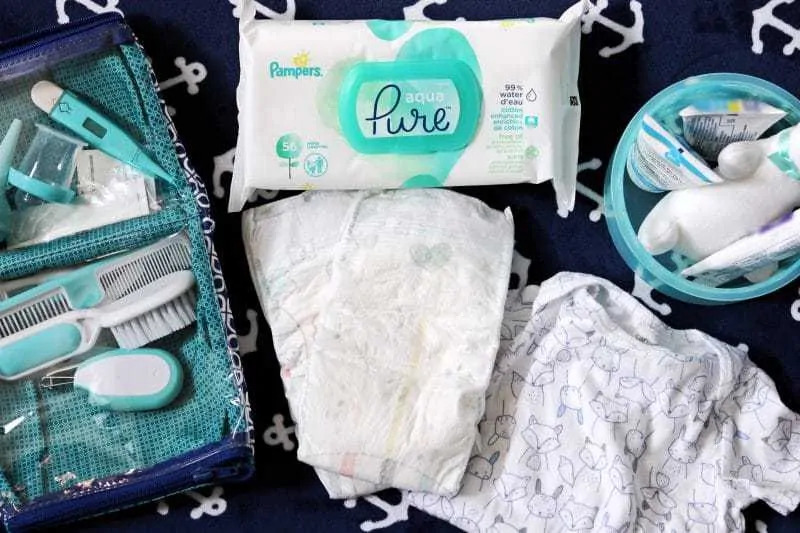 Make diaper duty as easy and enjoyable as possible by following these tips to set up a diaper changing station at home stocked with all your diapering essentials. Diaper duty may not be the most exciting aspect of parenthood, but it can still be an enjoyable bonding experience between you and your little one. I have found that having everything that we need in our diaper changing station really makes diaper changes run more smoothly. That means more fun for the little guy and I! I like to make diaper changes as fun as possible for Nathaniel. I sing to him and play with him during his changes. He bursts out in laughter when I blow raspberries on his tummy or tickle his little tootsies. I cherish these moments! 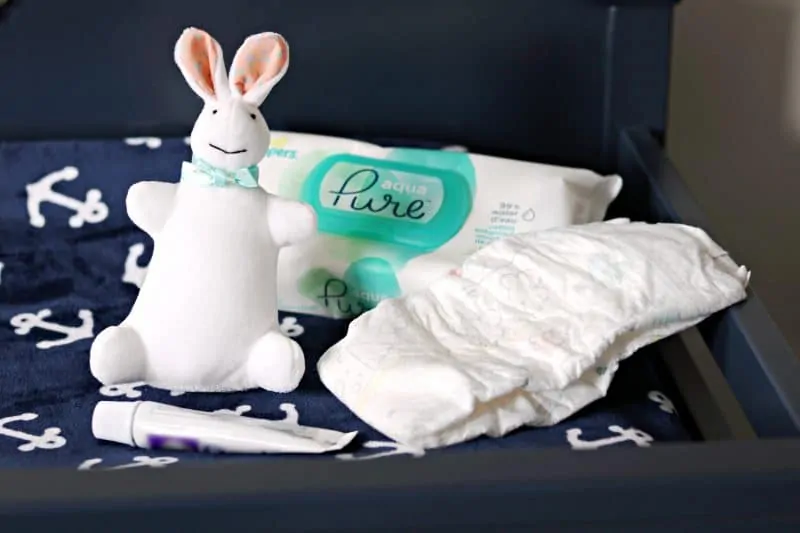 Whether you are still expecting or just want to give your diaper changing routine a little bit of an upgrade, the following tips will help you to get your diaper changing station setup with all the supplies that you will need to making diapering time as easy and enjoyable as possible. If you are tight on space you can place a changing pad on top of furniture in baby’s nursery. 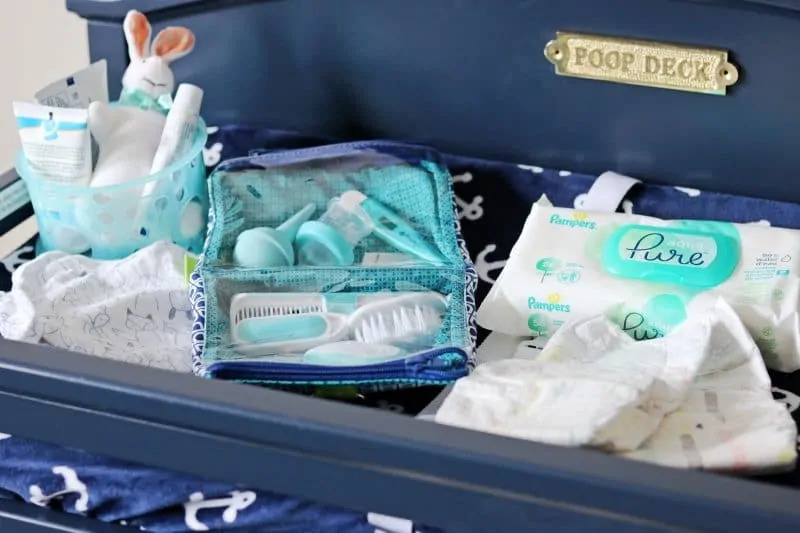 Dressers are great for this, and often have room for you to place a diaper caddy next to the changing pad to help keep all your supplies in arms reach. If you have room in your nursery, I would recommend that you get a dedicated changing table that has lots of storage underneath. We found this navy blue changing table that fits our son’s nautical nursery theme perfectly and has two shelves underneath that were perfect for popping some storage bins in. 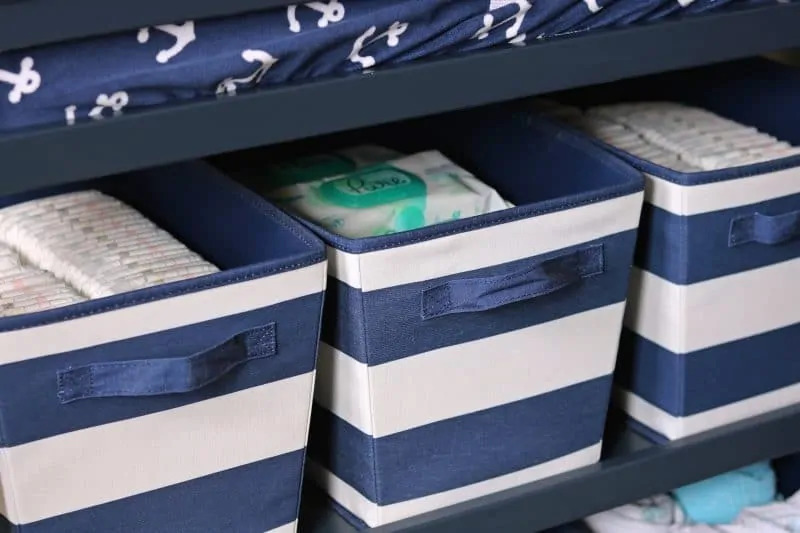 These storage bins have been amazing for helping to store all of Nathaniel’s Pampers Pure diapers and wipes, as well as his other diapering essentials. Changing Pad. Whether you set up your changing station on top of a dresser or on a changing table, you will need a changing pad. There are a few features that you should look out for when shopping for a changing pad. A pad that is contoured helps keep baby on the pad. Also, look for a pad that has a safety strap that straps baby on to the pad like a seat belt. Changing Pad Cover. Changing pads themselves are typically plastic-coated and I feel like they are too cold and uncomfortable for baby’s delicate skin to be laying on. I recommend covering your changing pad with something soft and comfy. We chose a navy-blue cover with little anchors on it since it fits our nautical theme perfectly. Diapers. Yeah, I know, this one is pretty obvious. A diaper changing station will need diapers… and lots of them. It is important to keep your changing station stocked with diapers at all times. You don't want to end up holding a diaperless baby while searching around frantically for a diaper. We have Nathaniel's diaper changing station stocked with new Pampers Pure Protection diapers. When I learned that Pampers had come out with this new collection of diapers, I couldn't wait to try them out on our little guy. Pampers has really raised the bar with Pure Protection diapers. These diapers feature plant-based fibers and other thoughtfully selected ingredients and are gentle on baby's delicate skin. They are made without chlorine bleaching, fragrances, parabens, natural rubber latex, and other common allergens. In fact, they are clinically proven to be hypoallergenic. 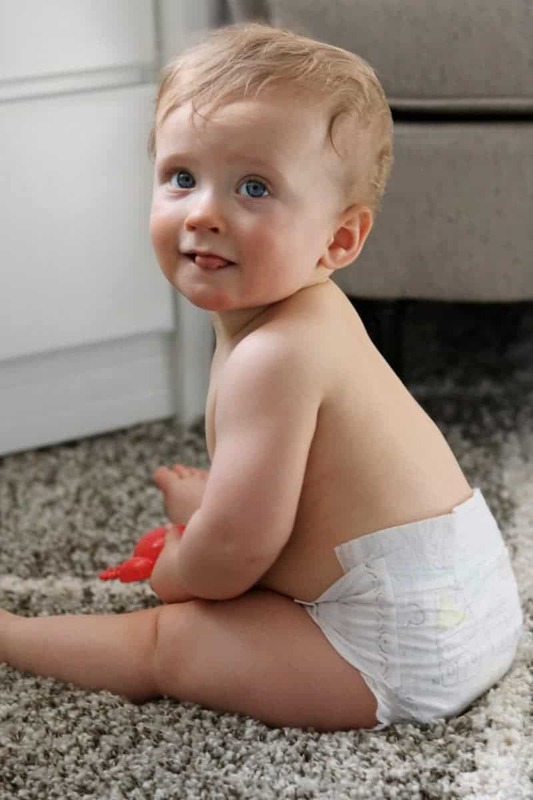 We love how soft and gentle Pampers Pure Protection diapers are on Nathaniel's delicate skin while still being super absorbent and offering up to 12 hours of leak protection. They even have that wetness indicator strip that lets us know with a quick peek if his diaper is wet and needs a change. And not to be too superficial, but I just adore the cute prints on these diapers. The little illustrations are totally adorable and make me smile at every diaper change. It’s the little things! I recommend you give Pampers Pure Protection diapers a try for your little one. They are such high quality that I am sure you won't be disappointed. Pampers Pure diapers can be purchased in bulk at your local Sam’s Club or online at samsclub.com and are available from newborn to size 5. Wipes. You will be amazed how quickly you go through baby wipes. Save yourself some money and trips to the store by buying wipes in bulk. 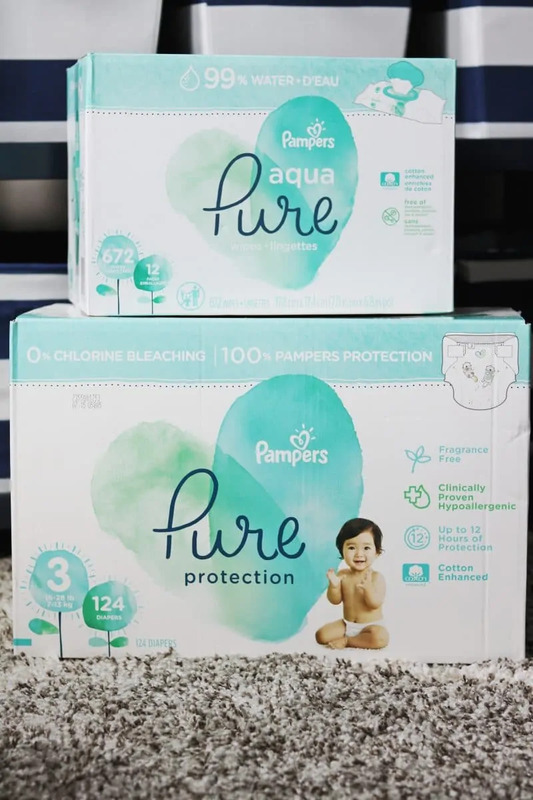 We stocked up on new Pampers Aqua Pure wipes, which, like Pampers Pure diapers, are soft, gentle, and hypoallergenic. They contain 99% pure water and are free of any fragrances, alcohol, parabens, or dyes. Pampers Aqua Pure wipes can also be bought in bulk at your local Sam’s Club or online at samsclub.com. Diaper pail & liners. Unless you want the entire nursery smelling like a dirty diaper, you will want a good diaper pail. There are many different diaper disposal systems out there to choose from. My advice is to select a pail that is hands-free, because you will have your hands full between the soiled diaper and holding onto your little one. Our diaper pail has a foot pedal at the bottom that we just step on to trigger the top to open up so that we can pop the diaper in using one hand. Diaper Rash Cream. Keep diaper rash cream handy to use during changes to help prevent your little one from getting a rash. Extra clothing. Babies get messy. Keep an extra set of clothing at your changing station for those times when baby's clothing gets messy. Pacifier or small toy. Babies aren't huge fans of diaper changes. Keep a pacifier or small toy handy to soothe baby and keep them entertained during changes. I have found that singing to baby works as a great distracter as well. First Aid / Grooming Kit. Having a small infant first aid / grooming kit at your diaper changing station makes tacking tasks such as taking baby’s temperature, clipping baby’s nails, and suctioning out baby’s nose with a nasal aspirator as easy as possible. Babies aren’t typically a fan of these tasks, and I have found that having baby laying down on his changing table and distracted with a toy is super helpful when I try. Do you have any diaper changing station essentials that I didn't mention?! If so, I would love to hear them in the comments below! Omg I needed this like 10 years ago lol! Aww, your baby is so cute! There is nothing like the comfort of having a stocked changing area. Great tips! 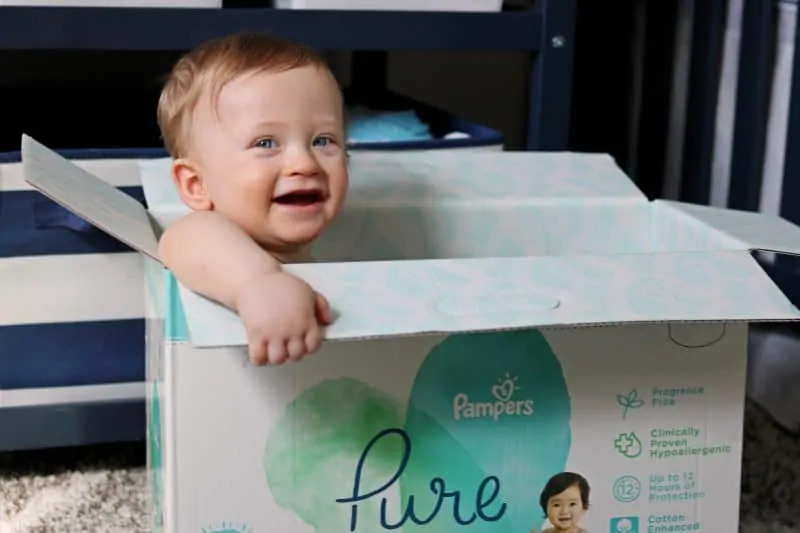 That is great that the Pure diapers are free from parabens. Setting up the diaper station was a lot of fun of me as I prepared for my babies. It really becomes a central point in the nursery. I love your diaper changing station. My brother just had twins so I’m going to tell him about Pampers newest diapers. When my twins were born the diaper changing station saved my life! Love your ideas here – very practical. I am lucky I don’t need to have a changing table anymore but your ideas were so great for mothers with babies now. I wish I was as organized as you and kept everything in arms distance when I had my babies. The nautical theme really makes this diaper changing area cheery. I especially love the striped storage bins under the table for storage. Your diaper changing area is so cute! We loved using Pampers in our family. It seems like they are always improving the quality of their products. Oh my gosh, your son is such a cutie. I love how you set up your change station with the baskets. Your nursery is darling! I love the new water wipes that do not have chemicals It’s all we buy at our house for anything and everything. We even keep a package of Pure in the trunk of our car! I wish they had been around when my kids and grandkids were in diapers. I used baby wash cloths wet with water. Made for a lot of laundry. Ha! Especially with my kids who wore the old fashioned cloth diapers. I love the poop deck sign. That is so cute. Thanks for posting!